Brace yourselves, this will not be the gushing happy-happy-joy-joy post everyone else is doing when it comes to this book. I will be the black sheep because it fell very flat for me and I had major problems with characters & plot. Dimple wants nothing more than to be herself and not be held to the customs of her traditional Indian parents. She just graduated high school, has been accepted to a prestigious college, and has a passion for wanting to prove herself. She certainly is not thinking about marriage, kids, and giving up her dreams. Enter Rishi. He is the complete opposite – he wants to respect his parents traditions. He wants to meet a girl (even if it is an arranged marriage), get married, start a family, and uphold his deep family customs. They meet in a very unorthodox way but maybe something will blossom between them? Maybe they both have to really listen to their hearts to figure out what is best for them. There is a lot of hype around this story. I mean, a metric ton of hype. When that much hype surrounds a story, as a reader I feel I have more pressure to like it as much as everyone else. Unfortunately, that did not happen for me. Not even close. The more the story continued, the more problems I found with it. I know what you’re thinking, “Sara, it’s just a story! Enjoy it!” Sadly I could not because too many things bothered me and overall it was not believable. Let me explain. Dimple. I had a huge problem with Dimple as a whole. The first thing that stood out to me is that she came across super aggressive and rude. She was a bull in a China shop nearly the entire book and it started to grind my gears. She was rude to her parents, to her new school roommate, her roommate’s friends, the head of the summer program she was attending, everyone. When she yelled and was disrespectful to her parents several times, it made me like her less and less. They all needed to sit down and have a long talk about everything but that never happened. Dimple yelled at her parents for being too old fashioned and traditional, while Dimple kept screaming, “I DON’T NEED A MAN!”. What neither understood and it was never talked about is how they are different generations. They were brought up in different countries so beliefs and thoughts could be completely different. Maybe if Dimple had used her inside voice, it would have helped her parents understand her better. But what do I know. I get that she felt she had something to prove but calm down, sweetheart. Ever heard of the phrase “you catch more flies with honey than vinegar”? It is true for a reason. Besides all of that, she was a completely inconsistent character. What do I mean? I mean she started out the story being very confident, sure of herself, ready to face the world and I liked that. I liked it a lot. But then in the next paragraph she would be meek and oh no are they looking at me?! It gave me whiplash. Either you are strong and confident or you are a meek butterfly trying to figure out who you are, Dimple, you cannot be both. She really, really needed to get those emotions in check because she really was all over the place. I thought she was having manic episodes so many times because she would be super excited one moment, then screaming about how unfair it was that her mother wanted her to wear makeup. The plot. Or should I say the lack of a plot. First, let me get this off of my chest: Why is the name of a summer coding course named Insomnia Con?! It makes no sense! These kids slept a lot so the name just baffles me. Ok, I’m better now. Promise. Second, the point of this course is supposed to be this group of students learn how to develop and code a new phone app. I’m down with that. It would be great for those looking to build their coding skills. But wait! None of that happens in this story. Anything to do with actual school is glazed over with “the weeks fly by as we draw closer to the submission portion of our project”. I am paraphrasing but that is basically how it went down. These kids just have too much free time for an expensive 8 week program. The bulk of the time at “Summer School” (I use quotes because there is no learning that takes place from what I read…) was the students focusing on a …. talent show. Riddle me this: Why does a school program like this have a talent show? Why is so much focus on said talent show? How is this teaching these students how to code or anything to do with college? Oh that’s right, it doesn’t. There’s a massive chunk of the story devoted to figuring out what to do at said talent show, weeks rehearsing for said talent show (no coding or school work though), and then drama at said talent show. Suddenly BOOM – it is the end of the 8 weeks and projects are submitted for consideration. Wha? 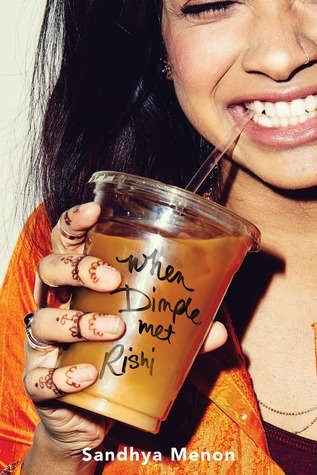 We did see a lot of emotions happening between Dimple and Rishi, which is good… I guess. If you ignore the issues I had with the characters then it was okay. Actually, I didn’t feel the gushy feels towards this couple. I was not swooning or shipping these two. The ending did not surprise me at all. It felt just too perfect. It felt as if Menon tried oh so hard to wrap everything up in a pretty package. I didn’t buy it. -Discussion of Indian culture and Indian race. I liked how clueless rich white girl made rude and insensitive comment about “their unusual names”. Rishi quickly claps her back, puts her in her place, and shuts her down. I felt so happy for them at that moment. -The cover is super adorable. It makes me think of happy summer days. That’s all I have at the moment. Sorry. This may be one of the longest reviews I’ve done in a while. WHEW. I had some thoughts and feelings to get out. I tried so hard… SO HARD to love and enjoy this book. If you don’t agree with anything I’ve said, that’s fine and I wish you and I could swap places. I wish I could have loved this book as much as you did. I feel so awful for wanting to love this book as much as other readers and it just not happening. Great review! Let me tell you it’s so nice to hear someone else who shared my some feeling about this overhyped book! Completely agree with you on everything you mentioned! I just can’t see how everyone missed all these obvious flaws of the characters and the nonexistent plot and all the ridiculous instalove stuff! Thank you! I started to believe I was alone with my dislike of this book. Instalove is a huge turnoff for me and this book was swimming in it. I didn’t get the hype around it AT ALL. Me too! Yes exactly! I don’t even see any part of this book that was salvageable to be honest. Yeah I’m pretty sure a lot of people got excited cuz of the Indian twist it had which was okay but not amazing and could’ve been done in a much better way too! It read as if it needed to be heavily edited/revised. There was so much potential but it fell so short. Wonderfully written review! I definitely agree with you about Dimple – she definitely was NOT a likable character. She was overbearing and selfish. Her parents pay and let her go to this summer program but yet she has the nerve to yell at her mom over the phone in front of Rishi without taking anyone else’s feelings into consideration. Aside from the characters I found the book to be a quick and fun summer read so I guess I could say I enjoyed it, but it’s not the type of book I would ever read again.